Otley CC President Mr. Michael Rhodes awards the Ernest Walker Trophy for Man of the Match to Paul Nicholson for 4 victims behind the stumps. 16:45 – Jamie Pickering hits a single to win the Waddilove Cup for Otley. This is Otley’s 12th victory in the competition and the first since 1988. 16:43 – Jamie Pickering hits a four to tie the scores. 16:00 – Otley are making hay in the sunshire with Ben Morley hitting Steve James for consecutive sixes into the graveyard, and a third down the ground – Otley are 43 without loss after 4 overs. 15:15 – Steve Booth is last man out as Collingham are dimissed for 96. 14:55 – Collingham are now 84-7 with 17 overs remaining. 13:08 – James Davies strikes, having Hohn Swain caught behind by Paul Nicholson for 2. Collingham are 3-1 after 3 overs as Toby Jacklin comes to the crease. 13:05 – James Wilcock opens the bowling from the Pool Road end, Collingham are 2-0. 12:58 -James Davies opens the bowling for Otley from the Graveyard end. 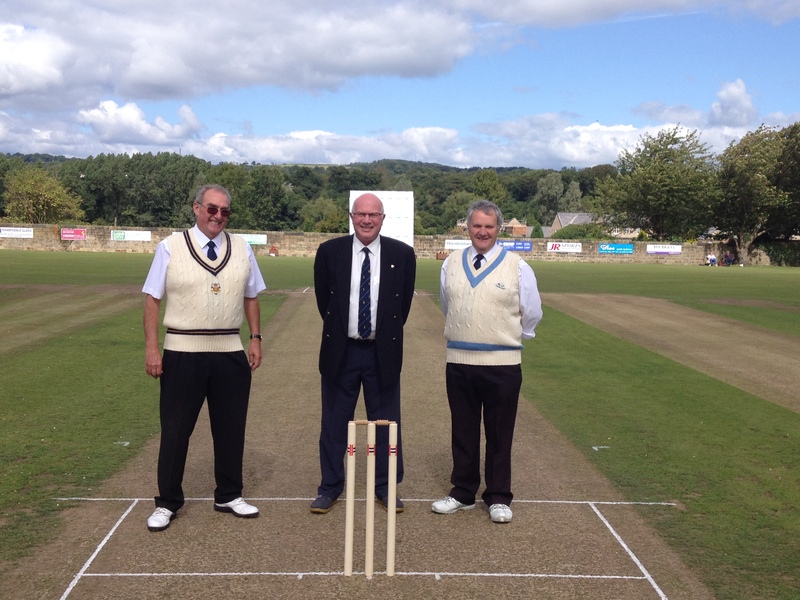 12:47 – The umpires Tony Crowther and Alan Kitchen with 3rd umpire Phil Sant. 12:45- Collingham & Linton skipper Sam Anderson won the toss and elected to bat.